“A single or repeated act or lack of appropriate action, occurring within any relationship where there is an expectation of trust, which causes harm or distress to an older person.” This was adopted from the UK's Action on Elder Abuse's 1993 definition. In Ireland, the definition adds "or violates their human and civil rights." Read again the answer to the above question. Signs of abusive behaviour towards an older person cannot be reduced to a checklist. Evil is very creative. Provided here is an amalgamation of signs of abuse gleaned from our research. It is by no means exhaustive. The bulleted entries are those that Dolores-Maxwell.com has received either direct proof or strong evidence of being pertinent in Dolores' case. 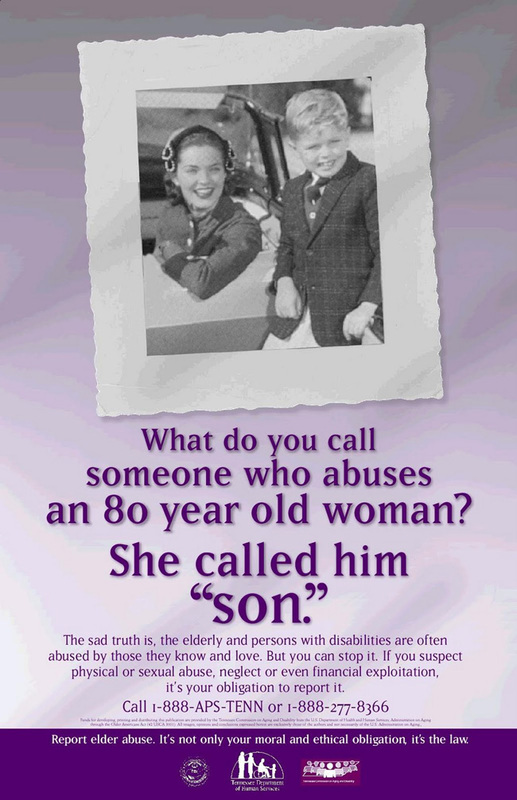 Most elder abuse is caused by a family member of the victim. This could be a son, daughter, spouse, grandchild, or other relative. Recent studies in Ireland estimate that 84% of Elder Abuse is perpetrated by family members and close relatives. The most common perpetrator is a son or daughter. This family member is often dependent on the older person for money or a place to live. The abuser might have psychological or personal problems such as chronic unemployment, alcoholism, or an abundance of stress. There may be a history of violence within the family. The abuser may have mental health problems. The abuser often has a history of anti-social behaviour and violence. Very rarely (about 5% of cases) does the person being victimized report their abuse. Very infrequently (about 14% of cases) do family members report the abuse. Most Elder Abuse is reported by non-family members and health professionals. Among the health professionals, Public Health Nurses report 40% of cases. General Practitioners account for only 3% of referrals. Who is required by law to report suspected Elder Abuse? Laws very widely throughout the world in regards to who is required by law to report suspicions of Elder Abuse. In Ireland there are no Mandated Reporters defined by law for Elder Abuse. There are no Mandated Reporters defined by law for child abuse. Most studies indicate 3-6% of people over 65 years of age are abused during a given year. It is estimated between 12,000 and 24,000+ seniors are victims of Elder Abuse in Ireland. Studies elsewhere have concluded that only 1 in 23 cases are reported. In 2009 1870 cases of suspected Elder Abuse were reported in Ireland. That would mean well over 40,000 of Ireland's seniors are suffering abuse. We are friends and family of Dolores Maxwell. Some of us are separated by generations, some by international boundaries, and some by continents. We are all united in our love of Dolores, and a desire for justice and change. Why is this website still under construction? Why are there flowers at the top of each page? Dolores loved flowers, and loved to garden. The images we use at the top of each page were taken by one of Dolores' grandchildren. They are used here with the grandchild's permission and copyright is retained by Dolores' grandchild. This site is supported exclusively through the website owners' funding. Donations are not accepted. No other funding is accepted. Can I help this site to achieve its potential? Absolutely! We are always grateful for any information about Dolores and the people, places and events surrounding her life. Photographs, documents, memories, etc. are always welcome. You are also invited to link to this site with no restrictions. Alternative views of events are also very welcome. Who or what is Alpine Memorials? Although you can find companies named “Alpine Memorials” in other English speaking countries, you will not be able to find one in Ireland or the U.K. Much like Mark Sinnott and Adrian Maxwell (see the FAQs below), Alpine Memorials doesn't exist. So why was the headstone on Dolores' grave sporting this gaudy plaque? And why was it removed all of a sudden? The short answer is that it is yet another scam perpetrated by Ethan Maxwell with the aid of one of his long time associates, Rory Mulhall. The long answer, when published, will be found on the Recent Updates page. Although there are of probably many people named Mark Sinnott, the particular Mark Sinnott we refer to here does not exist, per se. The “Mark Sinnott” we are speaking of is actually one of Ethan's aliases. Inventing a solicitor's firm named Sinnott and Co. Solicitors, and using the then address of his associate and “family spokesman” Lloyd Montgomery, Ethan posed as solicitor Mark Sinnott, as he sought to intimidate some people he was trying to exert control over. We believe it to have been a classic shakedown attempt. On other occasions Ethan would take a different approach when trying to intimidate people with his letters – he would refer them to his solicitors, Jaggers and Brass. Although there are of course many people named Adrian Maxwell, the particular Adrian Maxwell we refer to here does not exist, per se. The “Adrian Maxwell” we are speaking of is actually one of Ethan's aliases. This name was used in an attempted health insurance scam by Ethan that played out over several months in 2010. It was ultimately unsuccessful. Who was Cecil Maxwell's Death Certificate Issued To? Ethan Maxwell. It wasn't issued to his wife, Dolores, who would have needed it to deal with property, financial, and other issues. A much clearer picture of the circumstances and cause of Cecil's death and its aftermath is now emerging. Dolores-Maxwell.com will publish this disturbing information when appropriate. After Dolores Changed Her Will, Why Did She Make Another One A Week Later? Dolores' original will, made with Cecil, was superceded when she made a new will on May 28th, 2009. This was made and witnessed at her solicitor's office, witnessed by a solicitor and a legal secretary. On June 4th, 2009, one week later, she made her current will, witnessed in Rosslare. Unlike any of the the previous wills, in this will Ethan Maxwell is named as executor. This time at least Damian Brass was telling the truth. Documents provided to Dolores-Maxwell.com reveal at least four (and it seems more likely to be five) wills made in the 18 month period following the death of Dolores' husband Cecil, as her youngest son Ethan consolidated his control over Dolores' life and purse. Who Witnessed the Rosslare Will? According to the will,it was Mr Taxi Driver and his wife. See The Taxi Letter. Yet Mr Taxi Driver stated that he never witnessed, signed or even saw Dolores' will. His wife, the second “witness” to Dolores' will, stated that she can't recall if Dolores signed her will in her presence. This will was “executed” a few days after a will was made in the offices of Jaggers and Brass, Dolores' solicitor. It was also “executed” in Rosslare, far from any solicitor's offices or sight. It is of course a requirement that a will is signed by the Testator in the presence of the witnesses and that they witness the will being signed. Dolores' executors were made aware of these statements on June 17. The executors of Dolores' estate were requested by one of Dolores' beneficiaries to clarify the standing of these witnesses to Dolores' will. It was suggested that Affidavits of Attending Witness be sought from Mr Taxi Driver and his wife. We cannot tell if this was sought, as the beneficiary who requested this has received no answer or clarification from the executors. It's been with no response from Jaggers and Brass on this matter. We do know that no Affidavits of Attending Witness have been registered with the Probate Office. Dolores-Maxwell.com makes no judgement concerning whether or not the statements made by Mr Taxi Driver and his wife are true. We do have absolute confidence in this: the fact that they made these statements is undeniable and proven. Did Dolores Write A Letter On September 3, 2010? Apparently Ethan desires someone to believe that she did. On November 4, 2010, during Dolores' hospitalization, access to her house in Rosslare was finally gained. As reported elsewhere, Ethan had sanitized and prepared the house to his satisfaction. He cut the power, phone, alarm, and water to Dolores' house, and finally turned the front door key over to Dolores' solicitor. The solicitor, the HSE Elder Abuse Caseworker, Nathaniel and Saoirse opened the house. A letter addressed to Ethan, “from Dolores” had been prominently placed for them to find. This letter, which was computer generated, was signed with Dolores' name. It gave control of her house to Ethan. It was dated September 3, 2010. Of course on Thursday, September 3, Dolores was in Wexford General Hospital, having been admitted the evening before with a very flushed face, bruises, confusion, amnesia, and heart irregularities. It was reported she had been confused for three days, experienced loss of consciousness while watching TV, had been hallucinating, and that her speech was slurred. She had no recollection of being transported in the ambulance. We have much information about this admission that will be presented at the appropriate time. For now, let us say that no, we do not believe Dolores, who did not type or use a computer, generated this letter. We do not believe she signed it. We do believe this letter was crafted by Ethan after Dolores' final September 26 admission as a way to justify certain things he did between September 24 and October 20. €500,000 is the approximate figure that evidence indicates Dolores and Cecil Maxwell lost to Ethan. This was realised in a number of ways including violence, threat of violence, coercion, use of non-authorized accounts (including credit cards, ATM's and cheques), property transfer and outright theft. This is equal to about £439,000 or $714,000. €40,825.82 is the figure that evidence indicates Ethan sought to realise from another set of victims. 8°C was the temperature in Rosslare at 12.15am, September 26, 2010. Dolores was rushed to Wexford General Hospital on that date. It's equal to about 48°F. Warfarin (named after the Wisconsin Alumni Research Foundation) was patented in 1941 as a rat poison. It acts by inhibiting coagulation of the blood. It is still used as a rat and mouse poison today, and has even been proven effective on vampire bats. It is used in humans to prevent clots, as a so-called “blood-thinner”, and in heart transplant patients. It is the most prescribed anti-coagulant in the world. It must be monitored very carefully and on a regular basis through the means of blood tests. Failure to exactly follow dosage instructions is extremely dangerous. Cranberry juice should never be consumed by anyone taking Warfarin. Dolores was on a Warfarin regimen. Eight percent is the amount of body mass Dolores Maxwell lost between September 8 and September 26, 2010. How long did Dolores Maxwell's post-mortem take? 165 days. According to the HSE, the post-mortem report takes at least six weeks to complete. Toxicology screens will add more time. In certain complex cases the final report may take longer. [Editor's note addendum 2: We know now that the information sent to the pathologist on June 8 was too late to affect this initial process, with Dolores' official death certificate being issued May 15. Although at least one member of Dolores-Maxwell.com was on the notification list with the Coroner, it was only found out through a third interested party (a month or so later) that the certificate was issued. This member had also requested the pathologist's office to inform her when the post-mortem was complete. We see nothing nefarious about the failure to notify our member by the Coroner, even though the Coroner's office has procedures in place and a responsibility to do so. It's Ireland. We await the full post-mortem results, and will seek further inquiry by the Coroner's office into Dolores' death. No. She was in the Critical Care Unit of Wexford General Hospital that week. She was admitted Sunday, September 26 at 2:49am. Ethan was with her. Ethan instructed the hospital that he was her sole next of kin, and not to inform any family members or anyone about Dolores, or give out any information whatsoever. He had also claimed that all of Dolores' other nine children were resident outside of Ireland. There is absolutely no doubt that Dolores was in the CCU that week. On that same evening Ethan called Dolores' home carer, Helen Jackman to inform her he was in his car on his way back home to Dublin. He told her Dolores was in the car with him, and that she would be staying with him all that week. So there was no need for Helen's daily half-hour home care visit with Dolores. It was directly because of that call that the rest of Dolores' family eventually found out on October 1 that their mother was gravely ill in the hospital. An oximeter is the little device that slips over your finger to measure the oxygen saturation in your blood. Irish EMT's use an oximeter which is integrated in their defibrillator pack. Dolores' oxygen saturation on September 26, 2010 when the ambulance arrived was 100%. The type of oximeter used by Irish EMTs is known as a “pulse oximeter.” Pulse oximeters mis-represent carbon monoxide as oxygen.